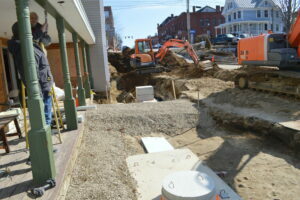 Jennifer Bjorn and her husband, John Moore, are making improvements to the landmark on Front Street in Farmington. 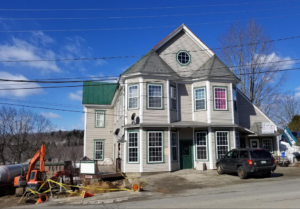 Jennifer Bjorn of Farmington is rehabilitating the former Granary building on Front Street in Farmington with help from her husband, John Moore. Sun Journal photo by Donna M. Perry. FARMINGTON — After watching the former Granary building on Front Street go through bankruptcies and auctions, Jennifer Bjorn bought it and is rehabilitating it with her husband, John Moore. Both are well-known for their business ventures in the community. She owns Bjorn Realty Corp. and he Narrow Gauge Cinemas. “It is Jen’s project and I am just helping,” Moore said. The building has housed restaurants, apartments and businesses over the years. Each time the building became seedier and seedier, he said. The restaurant, which is below street level, and the banquet hall on the main floor have been empty for a while. There are apartments above the banquet hall and a business on one side of the building. Craig Hutchinson and Harold Hargreaves of Taylor Construction in Wilton work on a sewer line Tuesday at the former Granary building in Farmington. Sun Journal photo by Donna M. Perry. For several years, the Farmington Rotary Club’s annual Festival of Trees lit up the banquet hall in conjunction with Chester Greenwood Day in December. According to Sun Journal archives, the building was constructed in 1890 and used for selling grain, flour, coffee, hardware and tools. It was called W.W. Small Co. until it closed in 1977. In 1977 and 1978, the basement and part of the main floor were remodeled into a bar and restaurant known as Bauer’s Back Room and Fiddleheads. The grand opening was Memorial Day 1978. In 1995, the building was remodeled again and renamed The Granary, according to Sun Journal archives. There will be a restaurant downstairs, but there are no tenants yet, the couple said. 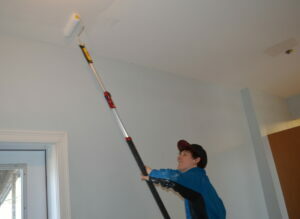 On Tuesday, construction crews and contractors from the area were working on the renovations. 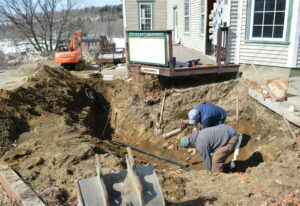 Workers were heating a line outside the building to hook up the new septic system. A new grease trap has also been installed outside the building. “We are taking the septic (system) out of the kitchen area and putting all waste products outside,” Moore said. A concrete wall in the kitchen has been removed to allow people to see food preparation. “It was time for a change. We did not want to have The Granary No. 3,” she said, adding a name change is planned.